Elvis Presley was born and raised in the 'Bible Belt' of USA. He read his Bible and prayed regularly. He was " a good man who also struggled with many challenges in his life. He was a deeply religious man." Elvis was eager to share his knowledge and in the mid sixties he held Bible studies at his home in Bel Air, California, where he lived while making films. In the seventies Elvis started to include more Gospel songs in his concerts and had the Gospel groups, the Imperials, the Sweet Inspirations and later, J.D. Sumner and the Stamps as his backing singers. He was also known to read passages from the Bible on stage during his concerts and insisted that the audience be reverently quiet while J.D. and the Stamps sang 'Sweet, Sweet Spirit'. Elvis did not like being called the King. When fans used to shout out from the audience "Elvis you're the King". He would reply, "No honey, there is only one King and that is Jesus Christ". 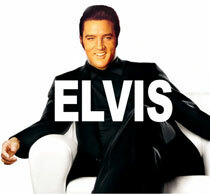 Elvis' best known Gospel song he sang is most probably 'How Great Thou Art'. During concert performances of this song, Elvis would sometimes personalize the song by singing 'My God how great I think You are'.